By A. F. Buechler, R. J. Barr, and Dale P. Stough. Cover shows light wear. Inside pages are nice and clean with light age toning. A nice looking original volume. This is an original 1920 edition by Western Publishing and Engraving Company, Lincoln, Nebraska. Detailed history of Hall County, Nebraska plus nearly 400 pages of family biographies. Includes many historic photos. 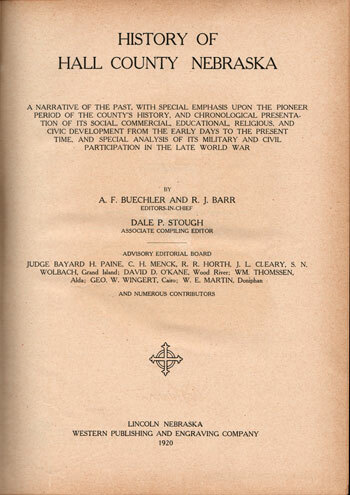 Also includes short biographies and photos of soldiers from Hall County, Nebraska who served in World War I.
Hardbound, 965 pages with index, thick, heavy volume. The book described above is priced at $79.95 plus $1.95 shipping. If you wish to pay by credit card, please use the shopping cart below (checkout goes to a secure server.) Credit card orders may also be placed by phone to Hearthstone Legacy Publications from 9 AM to 11 PM (Central Time Zone) Monday thru Saturday at 816-204-7593.